Singapore, November 26, 2018 | Singapore-based cross-border payments company TranSwap has launched its proprietary platform to help SMEs streamline their payment processes and seamlessly make FX payments at the most competitive rates. As SMEs are increasingly transcending geographical borders and going global, TranSwap’s platform allows businesses to make payments to over 45 countries. SMEs can also choose to integrate with TranSwap’s API for full automation of multiple transfers. Cross-border payments provided by TranSwap are now available on the NTP VAS listing. As a NTP VAS provider, TranSwap is part of the vibrant trade ecosystem that is the NTP – a Singapore Government initiative. TranSwap offers importers and exporters seeking to make payments internationally a cost-effective and convenient solution. “As an industry valued at over US$ 500 billion, coupled with the rise of fintech and increasing business adoption, cross-border remittance industry is poised to be the next big thing in Singapore, where businesses are constantly looking for alternative ways to make international payments. Launched in 2017, TranSwap has now offices in Singapore, Hong Kong, Malaysia and Indonesia, and have plans to have presence in the United Kingdom, Europe, and other countries in the Asia Pacific region. Soon, TranSwap will be able to process all major currencies to over 60 countries. 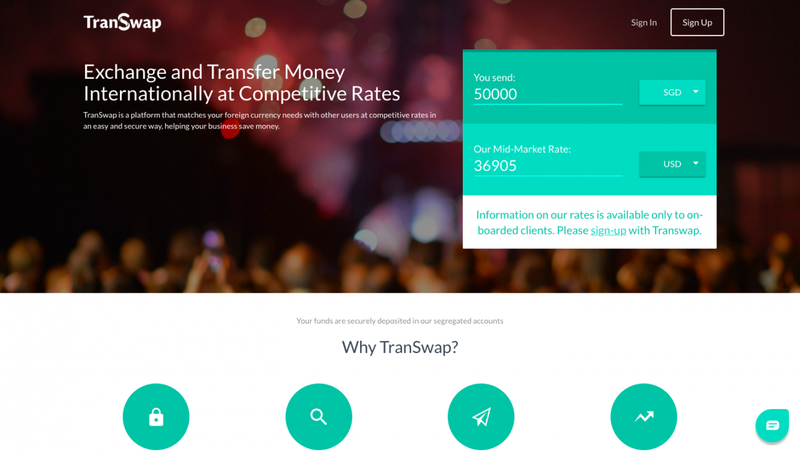 Currently, TranSwap customers can send money to more than 45 countries. TranSwap is a Cross-Border Payments Platform for Businesses which allows users to seamlessly manage and execute payments globally while reducing FX costs and complexity. It offers the most competitive rates through its proprietary online transaction portal and wide network of FX Partners to enable businesses to fulfill payments overseas at the lowest cost efficiently. In addition to TranSwap’s online transaction portal, cross-border payments provided by TranSwap are also available on the Networked Trade Platform (“NTP”) Value-Added Service (“VAS”) provider listing. As an NTP VAS provider, TranSwap is part of the vibrant trade ecosystem that is the NTP – a Singapore Government initiative. TranSwap offers importers and exporters seeking to make payments internationally a cost-effective and convenient solution. TranSwap is a safe and secure platform licensed in both Singapore and Hong Kong. TranSwap facilitates FX payments in more than 45 countries, and has offices and a network of partners in many countries.